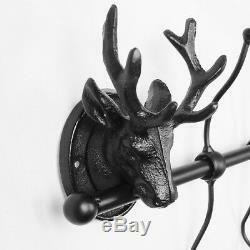 Wall Mounted Cast Iron Stag Head Coat Hooks---Powder Spray Coated-Antirust; Heavy Duty Metal Rack. These Cast iron stag head coat hook hanger is ideal for coats and hats at home and office where you want to add retro element making your room look elegant and stylish! 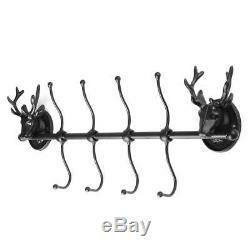 It features in its chic stylish stag head design, quality heavy duty iron material and antirust powder coat. 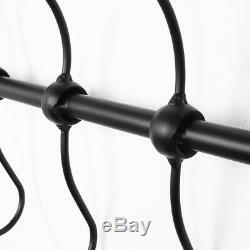 There are 4 separate hooks on each side (upper and underneath) handing up to 8 separate coats at a time. Heavy duty cast iron material. Durable in use: powder coated which is antirust. 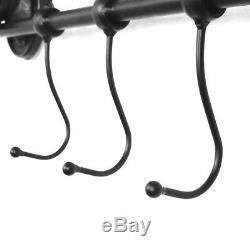 4 separate hooks at each side (4 hooks underneath and 4 hooks at upper side). Retro, chic design let you enjoy the ancient breath for your room. 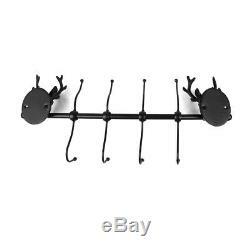 One rack as a whole body: very powerful connection, not easy to fall down. 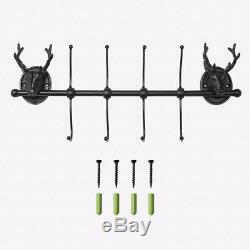 Comes with 4 screws: Simply to screw the hanger to wall. W50cm x H22cmx 7cm approx. Please note there might be minor size difference due to manual measurement. 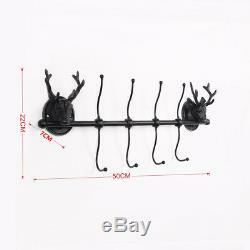 1x Iron Cast Stag Head Coat Hooks with 4 Screws. Sorry, currently we cannot send items to BF1 postcode area. Please provide us pictures of the package including the bar-code and package list and the item prior the return. (b)In the unlikely case that item is faulty on the receipt, we will send out the required parts ASAP to fix the problem. (d) We do not accept return for textile items which are used or washed, such as wedding chair cover, dining seat cover, spandex tablecloth, couch/sofa cover, disposable sheet cover, flat elastic, table cover, window cleaner scrim, Speaker Stand Scrim, etc. For the mentioned items we don't accept return if the item are used or washed. (We may request photographs of the package which including the bar-code, package list and the item prior of return before processing any damage claims). 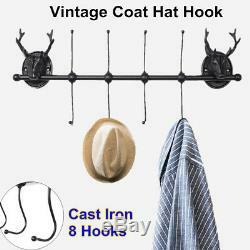 The item "Vintage Wall Mounted Coat Hook Clothes Hanging Rack Stag Head Robe Holder 8Hooks" is in sale since Thursday, August 23, 2018. This item is in the category "Home, Furniture & DIY\Storage Solutions\Wall Hooks & Door Hangers". The seller is "suretradingltd" and is located in UK. This item can be shipped to United Kingdom.